What follows is my opinion on nuking American Citizens who won't turn in their firearms to a tyrannical government. I'm sure you've heard by now about the gun hating lawmaker who'd rather nuke Americans than allow responsible people to own guns. Many folks on both sides of the aisle have written it off as a joke or sarcasm. There is a bigger picture here, though. To be honest, whether he was joking about nuking Americans for owning rifles or not is irrelevant. He still gave us a hint. There are a couple things going on and I'll make an attempt to break them down. He thinks Americans should not have guns. He clearly doesn't think I should own an AR-15. At this point in the game all logic is cast aside. There is no more arguing with these people. Those who hate guns will always hate guns regardless of any fact we spit out at them. No matter what, he doesn't want me to have the ability to have firearms. Of course, as we know with the slippery slope argument, while they say it'll stop and “nobody wants your guns” it can't stop until all guns are banned. He likens Americans owning guns to nuclear weapons. So, he essentially threatened to take away our guns. Some smart fella decided to respond by saying that we'd go to war, to which the brilliant Swalwell said that he'd nuke us. In other words, if we did resist to hand over our guns, he believes the only thing left to do would be to take the most extreme route possible to stop it. While I highly doubt it would be a nuke, because he'd be killing himself in the process, that comment shows us that he wants to go to the extreme should we resist. 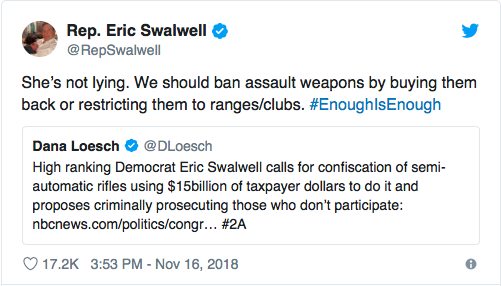 Swalwell (and other gun grabbers) = tyrants. He thinks only the government should have guns. His statement shows us in his ignorance that only the government should have guns. Because “the government has nukes” or, “this is not the 18th century …” and he would win based on superiority of weaponry. How quickly we forget. I seem to remember back when we won our original freedom doing battle against the greatest army in the world. Far superior to us humble Americans. Or, maybe that was his point with the 18th Century comment made in that tweet. Hmm. Even though he's supposed to represent us, he's willing to make sure that only he and his cronies have the guns. After all, he's willing to take extreme measures to take the guns away. By force. He tells us, once again, what the ultimate goal is for gun control: A ban. Many have said that they don't want to take our guns. Every so often though, one of them throws us for a loop and decides to admit what we've known for years. They are after the guns. This statement proves it. He admitted to it. It's just a matter of time. We're currently sitting pretty safe, but things could be going down the tubes pretty quick. Bump fire stocks will essentially be banned, and there are always some gun control measures trying to work their way through to become law. I am right, you are wrong. If you disagree get ready to die. Do I need to break this one down any further? I hope it doesn't come down to a war over freedom. I really do. But fools like Swalwell don't seem to want to give us a choice. That's one of the reasons why the Second Amendment is there. It's to ensure that tyrants won't rise up. But, here's the thing. They think they're right. They think they're so right, that our opinions (and the Constitution) don't matter. They don't matter to the point that they just admitted they're willing to kill us so that only people who agree with them are left. That's a scary point. We are willing to go to war to protect freedom. They are willing to go to war to take freedom away. But, there is that last point about him hoping we can talk to find some common ground. In the opening tweet, pictured above, he offers to talk about things. The word “ban” is not negotiable. How can you negotiate a ban? You either have something, or you don't. It's either banned, or it's not. There is NO middle ground in a ban. So I believe that he doesn't want to have these talks. I believe he wants all semi-automatic firearms banned without question. Why else would the term “ban” be used if that wasn't his goal? There are no talks happening. They plan to pass law and enforce it. Guns are bad and if you fail to follow the law they'll kill you. Sounds crazy but that's what he said. Did he mean he was going to nuke us? I don't think so because that would be asinine. Parts of the country would be uninhabitable for generations. But it does seem that death is on the table if we don't give up our guns. Leave us your thoughts on this topic, below in the comments section.